Please call 623-584-4999 or use our Online Volunteer Application. Volunteers are the heart and hands of Benevilla. The efforts of each one of our staff is multiplied by the support and contribution of generous volunteers. Together we form a safety net of “neighbors helping neighbors” that serves thousands of people each year. Because volunteers form the core, you will find a variety of opportunities to make a meaningful difference and develop close relationships that will enrich your life and the lives of others. Youth, group and family volunteer opportunities are available. – In general, volunteers must be 18 years or older. – Home Services volunteers must be 21 years or older. – Southwest Valley volunteers must be 21 years or older. – Youth can volunteer with a parent or guardian 21 years or older. 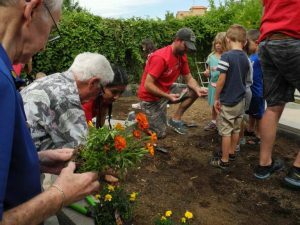 – Life Enrichment Program, Wirtzie’s Preschool, Administration and Maintenance volunteers must be 18 years or older to volunteer. Youth can volunteer at any age with the supervision of an adult 18 years or older.